Your favorite takeout Kung Pao dish, gone vegan!! Hearty, satisfying, and deliciously spicy… you’ll be amazed at the fantastic flavor of this dish! 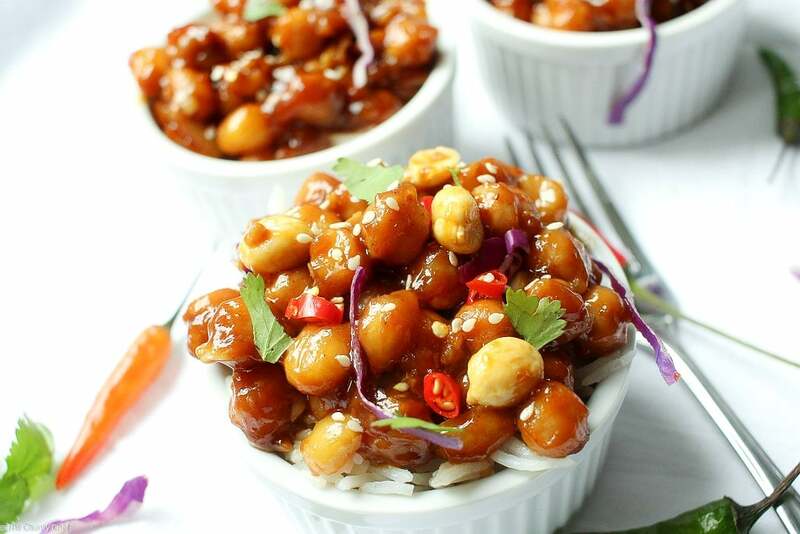 Just because you are eating vegan, that doesn’t mean your meals have to be boring… these Kung Pao chickpeas will amaze you with their bold, delicious flavor! Don’t let that lead in fool you… this. meal. was. awesome!! I’m definitely an omnivore and eat probably more than my share of chicken, but in an effort to lighten up our meals here at home, I’ve started incorporating vegetarian and even vegan meals. Guess what you guys… they’re delicious! This Kung Pao meal also comes together really quickly. Aside from the marinating time, you can cook this meal in about 10 minutes. For real! 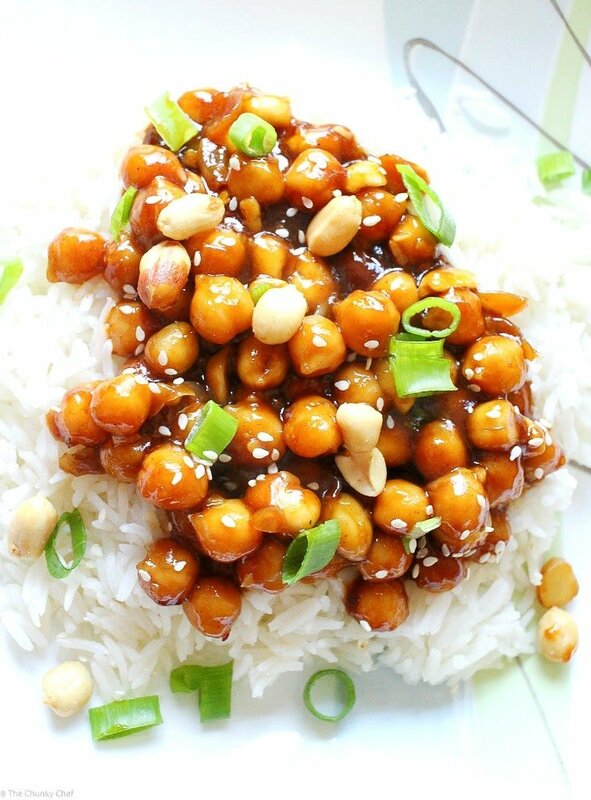 I tossed my chickpeas in the marinade and cooked my rice while they were marinating, that way I had the whole meal together in about 40 minutes, including marinating time! 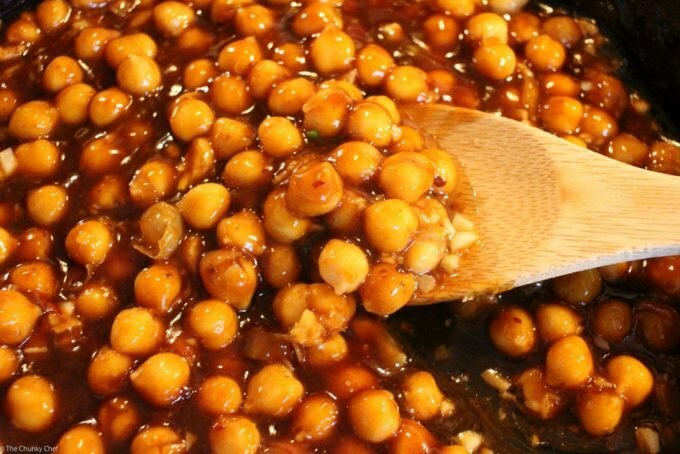 Once you’ve marinated the chickpeas, add some oil to a large skillet (or wok if you have one), then toss in your chickpeas, garlic, ginger, red pepper flakes, and stir. Pour in your Kung Pao sauce and saute for about 6-10 minutes, until they get as caramelized as you’d like. Serve over rice if you want. As far as garnishes go, it’s up to you! 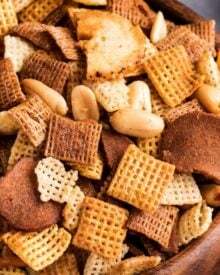 The night we ate this, I kept it simple and did sesame seeds, green onions, and some extra peanuts. For leftovers the next day (which are equally amazing, by the way), I went with some sliced red Thai peppers, cilantro, sesame seeds and shredded red cabbage 🙂 Interesting story about those Thai peppers…. they’re super cute, small, and colorful (they’re the red, green and orange peppers in the photo above). They’re also insanely hot. Like SPICY!!! Granted, I’m a self proclaimed wuss about heat, but still… whew! 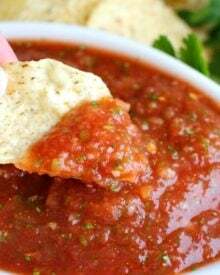 The spicy, sticky sauce is just amazing. You will hardly even notice you’re eating chickpeas! For more vegan dishes, you can check out my garlic and mushroom quinoa, or one-pan Mexican quinoa skillet. They’re super hearty too! 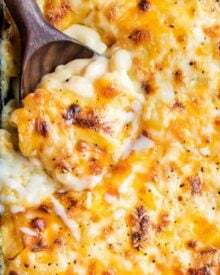 I found this recipe via Brandi on SheKnows. Your favorite takeout Kung Pao dish, gone vegan!! Hearty, satisfying, and deliciously spicy... you'll be amazed at the fantastic flavor of this dish! Combine all the ingredients for the marinade in a bowl. Add the chickpeas to the marinade, and stir. Cover and marinate for at least 30 minutes. 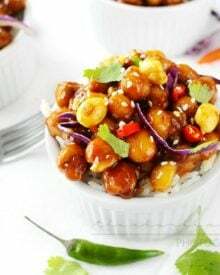 In a large skillet or wok over medium heat, add the coconut oil, the marinated chickpeas and the remaining stir fry ingredients. Sauté for about 6 to 10 minutes, until the chickpeas have caramelized to your liking. 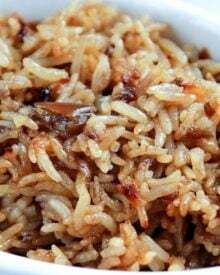 Serve over rice and garnish as desired. So glad I found this recipe! Accidentally forgot the lime, used Panda Express Kung Pao Sauce, and added Brown Sugar (tried to kill the heat….and was successful)! Thank you for a great recipe! Wow! 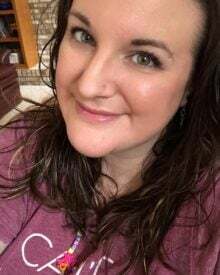 Fantastic post, Thanks, Amanda! Chickpeas for some reason have always been that one food that I would avoid trying. My only experience is the dreaded cold, wet chickpeas from the salad bar. When I finally tried cooking with them at home I was so pleasantly surprised. 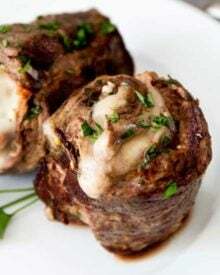 They are so creamy and contain almost a meatiness which makes them such a great meat substitute in vegan dishes. 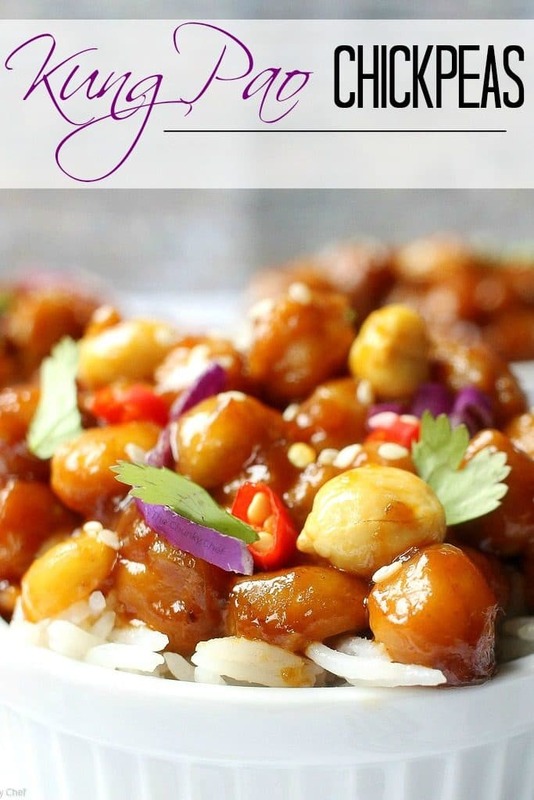 I cant wait to try this recipe, I am intrigued by the pairing of asian flavors with the chickpeas. Thanks for sharing! 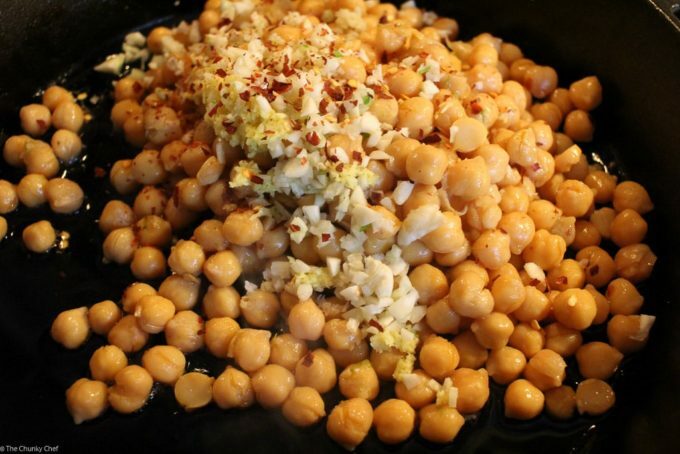 I love chickpeas and this recipe is the bomb. So good!! Well your photos certainly do your food justice as this looks delicious. 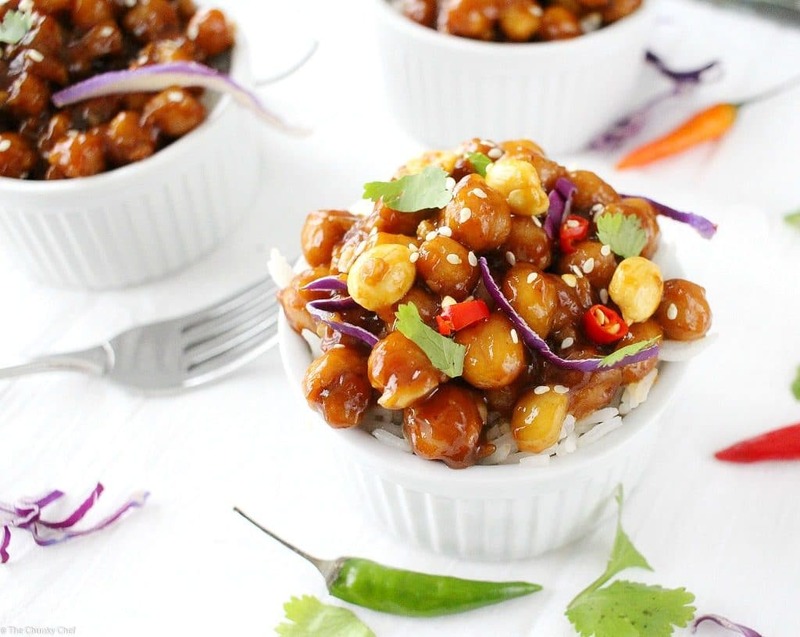 Love chickpeas and they are so versatile for different meals and textures. Thanks for sharing. Popping by from Veggie Wednesday. Looks and sounds tasty. Chickpeas are great at taking on flavor from a good sauce. This is an awesome recipe, I can’t wait to make it – and I definitely will not miss the chicken either. Thank you so much for sharing with Foodie Friends Friday party this weekend. Pinning & sharing. Thank you so much Joanne!! I hope you love it 😀 Have a great weekend! 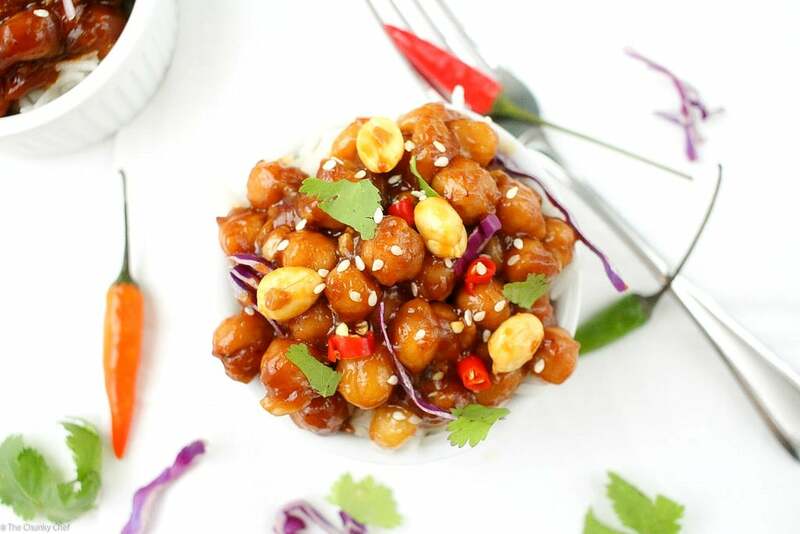 The Kung Pao chick peas looks so tempting! Would be perfect with rice! Cannot wait to try this recipe. I am saving it. Thanks for sharing. Happy FF! Thank you Suchitra!! I hope you LOVE it 🙂 Happy FF to you too! I love this vegetarian twist on a classic dish! Same great taste, but healthier for you, it’s a win win! Awww thank you Jhuls!! Tell you what, you can have as many as you’d like 😀 Happy FF and enjoy your weekend! This looks amazing! Definitely going on my secret “to try” board (and a couple of my public ones too of course). I’m an omnivore but I eat mostly vegetarian at home because it’s much kinder on your pocket haha! 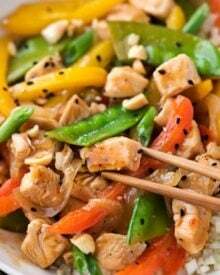 Kung pao chicken is what I always order from our local chinese, even though theirs has pineapple in and I’m allergic – I just like it that much! Oh, and about those thai chillies? We’re not the best of friends at the moment. I was chopping some up just the other day for a salad dressing and I scratched my eye in the middle of it! Never experienced pain like that before haha – had a shot glass full of milk to my eye while I was blending the dressing! Thank you Justine!! Chickpeas are awesome and that chocolate mousse sounds amazing for sure 🙂 Of course, I’ll make you up a bowl 😉 Happy FF! OH, be still my heart! I can’t wait to make this!!!!!! This looks so delicious- the perfect meatless Mondays meal. Now I just need to get my husband on board! I am going to have to try this. I am not a big fan of chickpeas, but my husband loves hummus (hummus is made out of chickpeas, right? ), and I love anything spicy. Thanks for sharing! Thanks Miranda!! 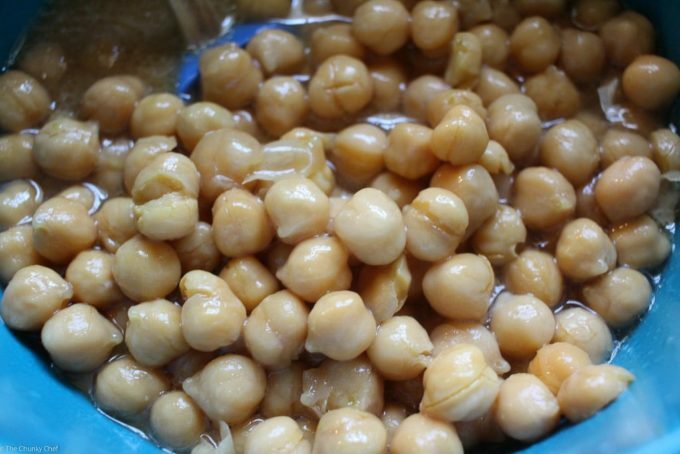 I’m not a huge fan of them either, but the sauce and other flavors really outshine the chickpea texture 🙂 And yep, hummus is made from chickpeas 🙂 I hope you love the recipe! These look so gret! I love love the vegan spin. Delicious! 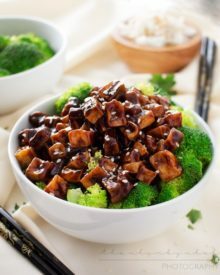 What an awesome and healthy vegetarian dish! 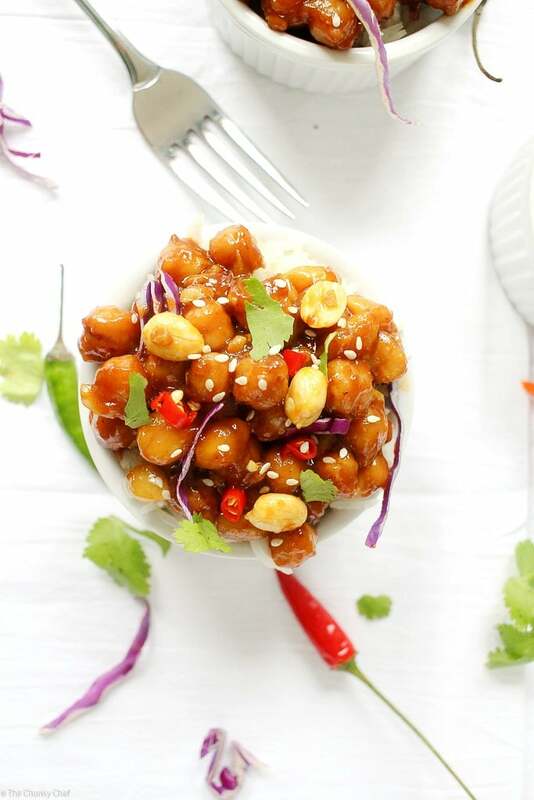 I love the flavour of kung pao and always order it for takeout so I must try this recipe out. Chickpeas. What a great idea. I love it. Gorgeous pictures, my friend. Those highlights! 100% lickable. Weiiiird, my husband and I were talking about chick peas yesterday and I was wondering what I could make with them besides falafels! You must have heard us! 😉 These look GREAT!!!! nom nom nommmm! PS- HAHA I can’t tell you how many times I’ve had those pizza coupons out and haven’t had to use them!! I love it when it works out!! Thank youuuuuu 😀 LOL must be that psychic connection 😉 Between these and making hummus (recipe to come lol), we always have about 5 cans of chickpeas in the pantry 🙂 Hahaha glad I’m not the only one with the pizza coupon stand-by!